I stained my marble flooring and lived to tell the tale. 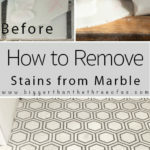 Today, learn how to get a stain out of marble as well as some alternative cleaning and stain removal ideas for marble. My Instagram followers are brilliant. Lots of them are in the housing industry or are avid DIYers. Many of them are just people (like me) who aren’t afraid to try something, people that hope for the best and are willing to deal with whatever comes their way in the house makeover journey. When I reached out on Instagram stories last week, I had a huge problem. You see, when we were laying our marble tile flooring in our laundry room, I marked the undesirable marble pieces (marble has such a variance in colors so I handpicked the pieces that I wanted to go in each spot) with a red wax pencil. Do you see where this story is going? Luke had gotten the chalk line tool out and with it there were the wax pencils. He had started using the red pencil to help keep track of the tiles that I wanted to use in inconspicuous places (the one’s with imperfections). Anyways, I thought it was smart and even told him that he had a great idea to use that pencil to mark the tiles. 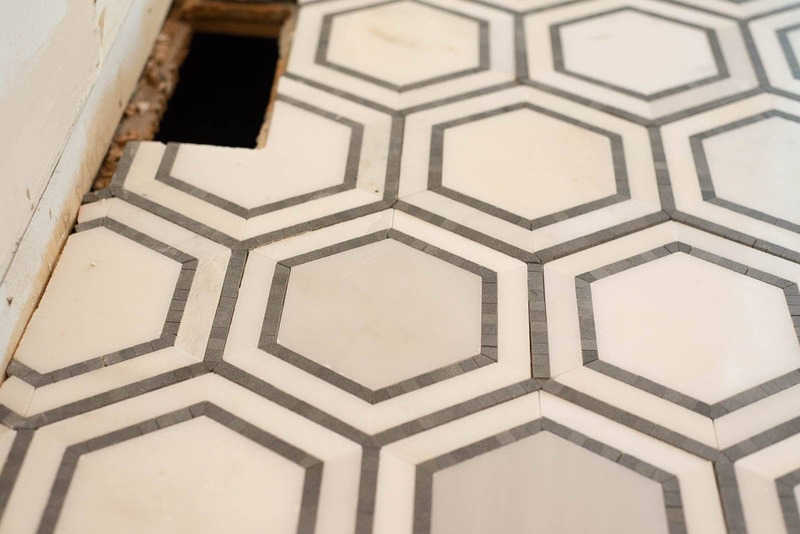 I continued marking the FRONT of the marble tiles as we went along. About three fourths of the way to being done with the flooring, we went back and wiped a few of the red marks off the tile. Or should I say, we tried to wipe the red marks from the tile. You could wipe off a bit of the red but the large X that I was making on the tiles to designate them as “not pretty” tiles were still visible to the eye. Fast forward a few days, the flooring is laid and we are ready to seal the tile before we grout. Before sealing, I was in charge of cleaning the red marker off and getting the floor prepped for sealing. There was dust everywhere and bits and pieces of mortar that needed to be vacuumed up. Well, I aggressively rubbed the marble tile with a microfiber cloth and, like I mentioned above, it made the red marks better but they were still there. Next, I tried some mild soap and water. That didn’t help. So, at this point, I reached out to my IG community on IG stories asking for help. I got so many responses! Some of them, like I said, came from professionals, other’s came from people who have stained their own marble and others came from people who are just willing to try something to see if it would work (like me). I rounded up most of the responses and thought I’d share them with you. They are listed in order of how often they were recommended. Make a baking soda and water paste and leave on for 1-12 hours, repeat as needed. Water down bleach and use a q-tip to clean. *Will probably etch a bit. Apply Hydrogen Peroxide and cover with Saran Wrap for 2-24 hours. Mix baking soda and mineral spirits. If you haven’t followed me for long then you might not know this, but I’m not patient or extremely careful. If I perceive that the risk of doing something is rather low, then I do it. So, I posted my question on IG stories around 2pm or so. I got a few responses after I got back home from picking Greyson up from school. By 4pm, I had already tried out the easiest response – the magic eraser. To be honest, I wish I would have waited and let you all teach me the best methods for removing the marble staining. All in all, I think I had about seventy people message me and give advice. BY FAR, the best advice was making the baking soda mixture and the vinegar. 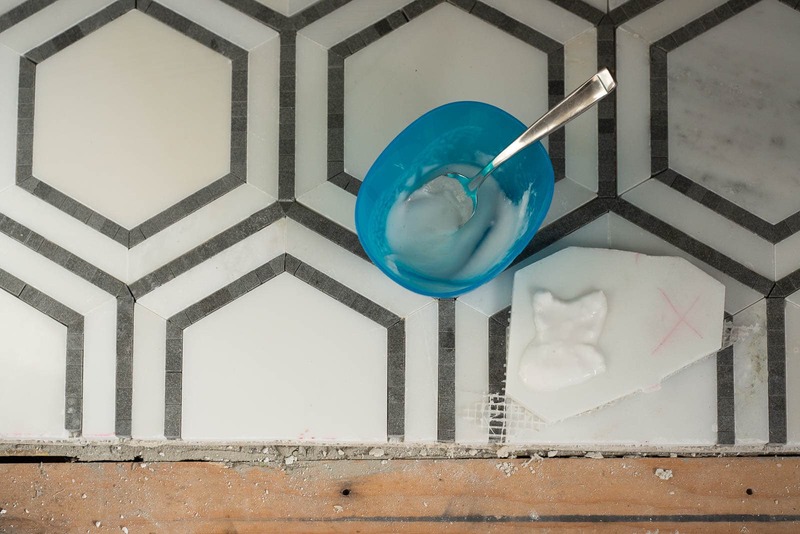 Those two were received over and over again and by people who regularly worked with tile and countertops. But alas, I didn’t wait… I went forward. Did the Magic Eraser Get the Marble Stain Out? Yes and no. It lifted most of the red out of most of the tiles but also smeared the red just a bit to create a red tint to a few. It also left 2-3 tiles with the red markings still. Overall, I’d say that this method worked pretty well. All in all, I’d say about 80% of the tiles look much better! I’d use the magic eraser again on the tiles if I need to as well. Can you see the light “X” in the middle of one of those tiles? I decided to go ahead and try to make a baking soda paste to get the rest of the staining out of the marble. 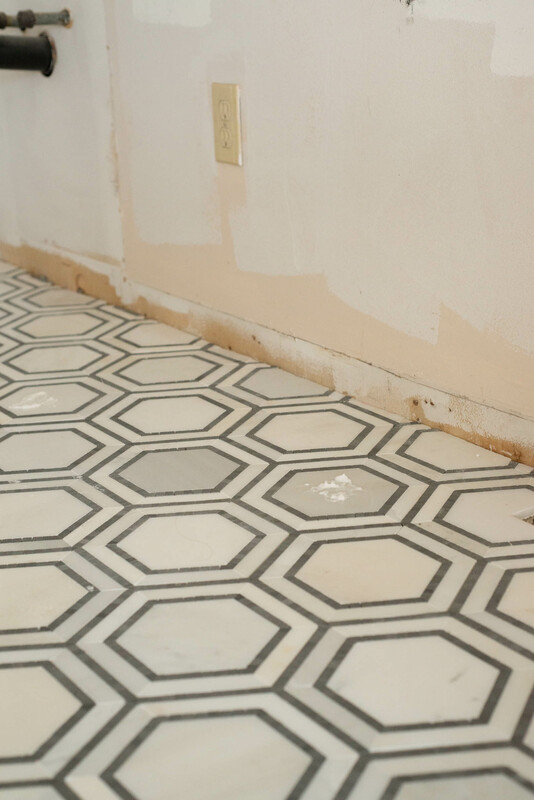 I got smart and tested this method before I applied it to my floors! The baking soda mixture for the marble stain worked great! I left it on for about an hour the first time to test it and it all came out. I went ahead and applied the baking soda mixture to the remainder of the marble staining and let it sit. I left it on for about four hours and it dried. With a damp rag, I was able to wipe it off pretty easily. I’m happy to report that the marble floor looks great now! You live and learn, right?! 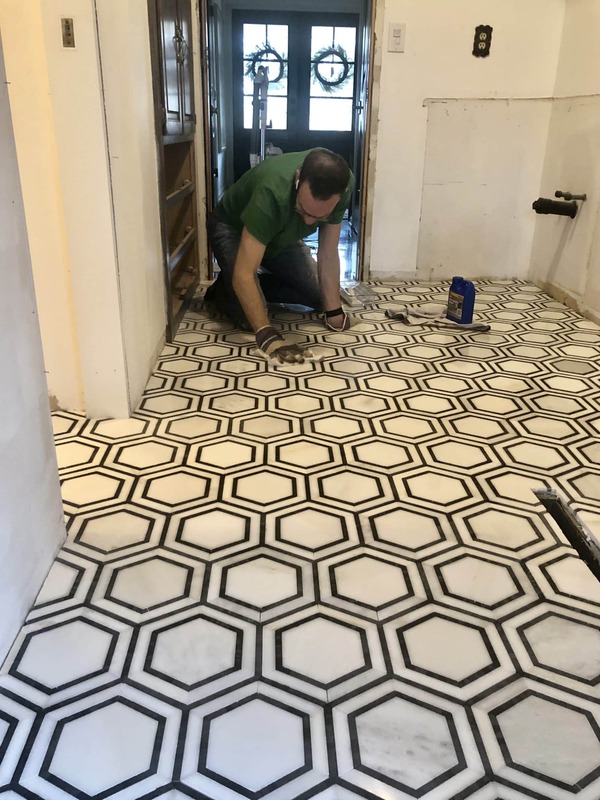 Ok, up next with our hexagon flooring is sealing and grouting. I’ll be back with the next steps when we get them done.